Ancient Forest Alliance | Working to protect BC’s endangered old-growth forests and ensure a sustainable, second-growth forest industry. Send an Instant Message for Ancient Forests! 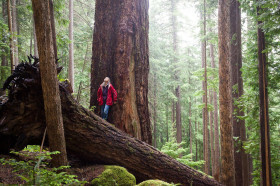 Let the NDP government know they need to take immediate action to protect old-growth forests! 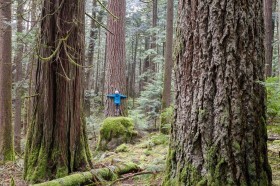 VIDEO: What Will it Take to Save BC’s Old-Growth Forests? 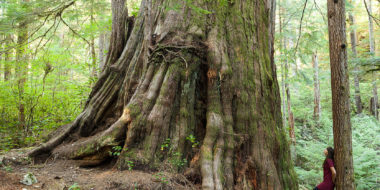 Conservationists with the Ancient Forest Alliance (AFA) are outraged that the BC government’s logging agency, BC Timber Sales, is currently auctioning off 109 hectares of old-growth forest adjacent to Juan de Fuca Provincial Park on Vancouver Island. 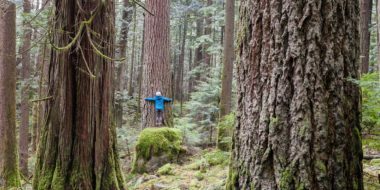 The magnificent but endangered old-growth forests of Vancouver Island are about to get a large-scale national audience on IMAX screens across Canada. Read on to hear more! Join us for the 35th Anniversary Celebration of the Meares Island Tribal Park! Join the AFA and the Iisaak Olam Foundation﻿ in celebrating the 35th anniversary of the Meares Island Tribal Park Declaration, Wednesday April 17th at the White Eagle Polish Hall from 6pm-9pm. Join our team! 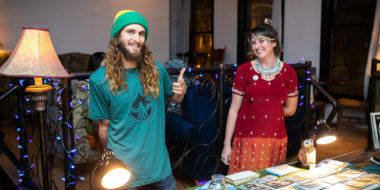 We are seeking a Field Manager to lead, grow, and motivate the AFA’s Vancouver canvass team to reach our supporters throughout the Lower Mainland! 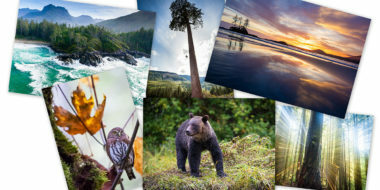 Check out this Global News piece about conservationists’ disappointment with the BC NDP and their plans to auction off 1,300 hectares of old-growth on Vancouver Island, featuring Sierra Club BC’s Jens Wieting, and footage by AFA’s TJ Watt. 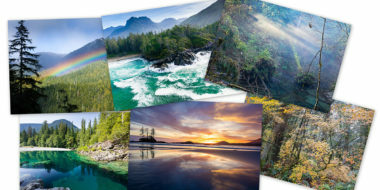 Don’t miss your opportunity to score a FREE Big Tree Poster set, take part in our awesome Earth Day t-shirt photo challenge, and pick up a gorgeous (and now discounted!) 2019 calendar before April 22nd! 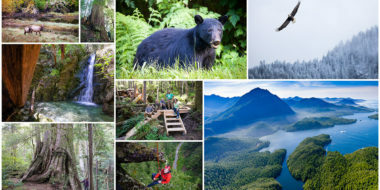 Environmental organizations Ancient Forest Alliance, Sierra Club BC and the Wilderness Committee call on the B.C. 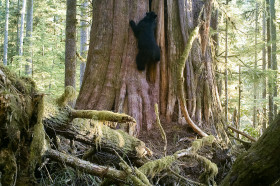 government to stop issuing logging permits in B.C.’s last remaining intact old-growth forest “hotspots” and endangered old-growth ecosystems and to implement legislation to protect endangered ancient forests. Just a half hour drive from Cathedral Grove is an ancient forest that is just about as impressive – the Cameron Valley Ancient Forest or “Firebreak.” This area is a valley-bottom-to-mountain-top old-growth Douglas-fir forest that was originally left as a moist, old-growth rainforest firebreak to stifle the spread of forest raging through the dry clearcuts. It was supposed to have been protected as an Ungulate Winter Range for the legions of magnificent Roosevelt elk and black-tailed deer that live here. 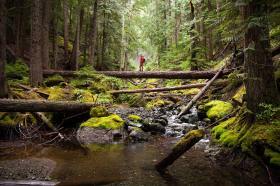 The Central Walbran Valley on southern Vancouver Island is the grandest old-growth rainforest in Canada. The area is jam-packed with hundreds of the monumental redcedars, especially in the spectacular “Castle Grove,” which is perhaps the most extensive stand of near record-sized cedars on Earth. Unfortunately this also makes the area a prime target for logging. Echo Lake is a spectacular, unprotected, lowland ancient forest near Agassiz, BC, in a region where virtually all of the valley bottom old-growth forests have been logged. The area is home to perhaps the largest concentration of bald eagles on Earth, where thousands of eagles come each fall to eat spawning salmon in the Harrison and Chehalis Rivers and hundreds roost in the old-growth trees at night around Echo Lake. he Edinburgh Grove, the most spectacular part of the Edinburgh Mountain Ancient Forest on its southwestern side, has also been nicknamed the ‘Eden Grove’. 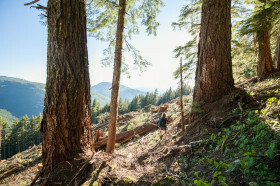 More than half of the Edinburgh Mountain Ancient Forest is open for logging, while other parts are protected as a ‘core’ Wildlife Habitat Area (the ‘buffer’ zone can still be logged, and has already been logged in several areas) for the endangered Queen Charlotte Goshawk, as an Ungulate Winter Range, and as Old-Growth Management Areas. 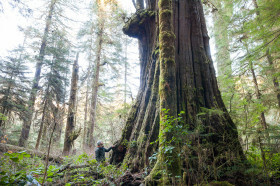 Katlum Creek is home to endangered ancient Douglas-fir stands, as well as old-growth hemlock, amabilis fir, and cedars. This area was originally supposed to become officially protected as Ungulate Winter Range for black-tailed deer, but unfortunately in 2004 the BC government environmentally deregulated vast sections of forest lands now owned by Island TImberlands in the region. 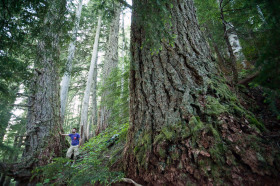 Conservationists are calling on the BC government to protect a 500 hectare tract of ancient Douglas fir forest near Port Alberni that biologists have classified as both critical habitat for wintering deer and nesting endangered Queen Charlotte goshawks. 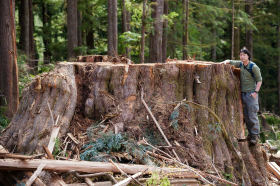 The BC government needs to protect the old-growth forest on McLaughlin Ridge by purchasing it from Island Timberlands. What’s Up in the Woods? Wednesday, Dec. 5th, from 7 – 8:30 pm at the Victoria Event Centre (1415 Broad Street). 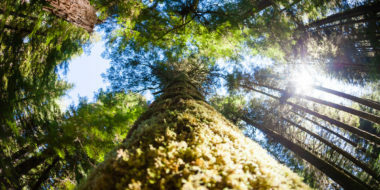 Join Ancient Forest Alliance, Wilderness Committee, and Sierra Club BC for an update on BC’s endangered old-growth rainforests and the movement to protect them!